A compact camera can be a comfier fit for your lifestyle. For ultimate photographic flexibility and versatility, you can’t beat a system camera based on a body and a collection of lenses. The problem is that the size and weight of the kit means you’ll probably leave it at home most of the time, thereby missing countless photo opportunities. At the other end of the scale, even the best camera phones aren't on par with a ‘proper’ camera. A good compact camera with a fixed zoom or prime lens is often the ideal solution for anyone who wants to take great photos just about anywhere and everywhere, anytime. Even so, some can be a lot more compact than others, and most have particular strengths and weaknesses. So if you're searching for the best compact camera to suit your needs and budget, look no further. We’ve picked out the best models that cater to a range of budgets and lifestyles. Now three years old, the Sony RX100 IV isn’t the latest or greatest thing on the market, and has actually been superseded by two newer editions of the camera. However, the Mk IV ticks all of the right boxes for the quintessential compact camera. It has a relatively large 1-0-type image sensor and a fast 24-70mm f/1.8-2.8 zoom lens, plus a high-resolution pop-up electronic viewfinder, despite being small and slim enough to slip into a spare pocket. Most importantly, it simply delivers fabulous image quality and even boasts a fast 16fps drive rate despite its generous 20.1 megapixel count. The new Mk VI edition has a much bigger 24-200mm effective zoom range, but its lens has a slower aperture rating and the camera itself is nearly twice the price. The Mk IV delivers unbeatable bang per buck. Think big in terms of zoom range and you’re probably thinking of a ‘bridge’ camera that has clunky SLR-type styling. 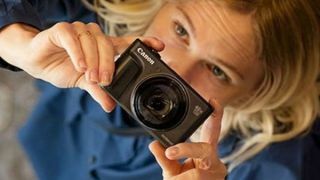 This new Canon PowerShot SX740 HS is small and slim enough to pop in a pocket, and comes in stylish black or silver options. The headline attraction is that the camera manages to shoehorn a mighty 40x zoom lens into its diminutive design, with an effective range of 24-960mm. So that’s everything from generously wide-angle coverage to ultra-telephoto reach on tap. Selfie-smart, the rear screen has a flip-over tilt facility, and the camera is equally adept as an action shooter, coupling its long telephoto reach with a fast 10fps drive rate. 4k UHD movie capture is also supported. The only disappointments are that the LCD isn’t a touchscreen, and the camera lacks a viewfinder. Best compact prime lens camera, this is a small camera that’s big at heart. At the heart of this new Fujifilm XF10 camera is an APS-C format image sensor, which is physically larger than that of most compact cameras, and is more usually found in DSLRs. It enables a generous 24.2MP image size, with low image noise even at high ISO settings. 4k UHD movie capture is also available, but only with a disappointingly slow frame rate of 15fps. The 28mm f/2.8 fixed lens is well-suited to low-light shooting, although the camera loses out to the Fujifilm X100F in this respect. The latter also features a viewfinder which is lacking in the XF10, but it costs more than twice the price to buy. Although it loses out in sheer zoom range to cameras like the Canon PowerShot SX740 HS, the FZ1000 still gives properly wide-angle coverage and stretches to seriously strong telephoto reach. Indeed, shooting at the long end of the zoom range benefits from the SLR-type styling and built-in viewfinder, both of which are lacking on the Canon camera. These enable a natural hold, so you can keep things steadier and avoid camera-shake. The 5-axis hybrid stabilizer is also a great help in this respect. Other luxuries include a relatively large 1.0-type image sensor, a vari-angle rear screen, and fast maximum drive rates. This camera is a better value option than the FZ2000, which has a slightly bigger 20x zoom range but costs much more to buy. Putting its superb APS-C X-Trans CMOS III image sensor to good use, this camera features a high-quality Fujinon prime lens, with an effective focal length of 35mm and a fast f/2 aperture rating. It also has an ingenious hybrid viewfinder, which gives you the option of a traditional optical view, or a high-res electronic display that enables you to preview the effect of exposure settings. Gorgeous image quality is particularly retained at high ISO settings, making the X100F ideal for twilight and indoor photography. Fujifilm’s excellent range of film simulation modes is also great to have. It’s a brilliant camera for street photography as well as for low-light shooting, but some will find the lack of a zoom lens restrictive, and 4k video capture is unavailable. Despite its diminutive dimensions, the TZ100 packs in a relatively large 1.0-type image sensor, a 3-inch touchscreen, an electronic viewfinder, a useful array of shooting controls, and a 10x optical zoom lens. That’s less generous than the 30x zoom range of the preceding TZ90, but the older camera had a rather smaller 1/2.3-type sensor. The TZ100 delivers excellent image quality, which it better maintains at high ISO settings, and the reduced 25-250mm effective zoom range should still prove ample for travel photography. There’s a 5-axis hybrid stabilizer that works well for both stills and movie capture, the latter with 4k UHD being available. If you really feel the need for a bigger zoom range, the TZ200 couples the same 1.0-type sensor with a 15x optical zoom lens, but is rather pricier to buy. Premium compact cameras from a number of manufacturers, including Fujifilm and Panasonic, often tend to feature prime rather than zoom lenses. By its nature, you can’t swap lenses on a compact camera, so a prime lens can be a serious limitation. This new up-market Canon PowerShot G1 X Mark III compact has a zoom lens, but with a modest 3x range to maximize optical quality. It delivers everything from serious wide-angle coverage to the kind of short telephoto reach that’s ideal for portraiture. The camera features an APS-C format image sensor and highly effective stabilisation systems for both stills and video capture, although the latter tops out at 1080p. The conventional placement of the electronic viewfinder and enthusiast-friendly layout of dials and buttons are ideally suited to creative photography. Tough by name, tough by nature, the TG5 is waterproof to a depth of 15 metres, sufficiently shockproof to withstand being dropped from a height of 2.1 metres, freezeproof down to -10 degrees Celsius, and crushproof enough to bear a 100kg load. Suffice it to say, this is a camera that’s not easily broken. It’s well matched to an adventurous lifestyle that might include the dizzying heights of mountaineering, the depths of undersea diving, and just about everything else in between. Features geared to the great outdoors include built-in GPS, compass, manometer and temperature sensor, data from which can be tagged onto your photos and videos. There’s also a neat ‘variable macro system’, enabling you to capture close-ups in microscopic detail. Available in silver, black or shocking purple, the slim, stylish and slightly rounded IXUS 285 HS is easy to slip into a spare pocket and take anywhere. It’s wonderfully easy to use and is refreshingly inexpensive to buy. Even so, it sports some useful features including a 12x optical zoom lens, built-in Wi-Fi and NFC, and one of Canon’s ‘HS’ image sensors that helps to retain good image quality at high ISO settings. There’s no viewfinder nor a touchscreen, but the 3-inch LCD is larger than in most cameras at this price point. All in all, it’s a top budget buy. Spend a small fortune on a camera and you’re likely to feel precious about it, which can limit your fun. One of the cheapest known-brand cameras on the market, the Nikon A10 has a two-figure price tag, so you’ll feel much more comfortable passing it around between friends and family, even if your family includes young children. The A10 is disarmingly simple to use yet boasts a 5x optical zoom lens, built-in flash and a respectable 16.1MP image sensor. At this price, the lack of a viewfinder and the relatively small, low-res LCD screen are to be expected. The maximum shooting rate of 1.2fps for stills and maximum video resolution of 720p might be more of a disappointment but, ultimately, this is a compact camera that the whole family can enjoy.